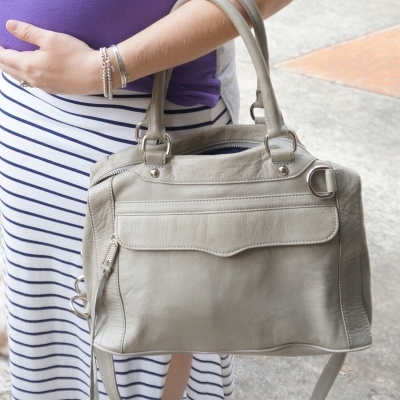 Two easy and simple pregnancy outfits. Purple tees, maxi skirts, and my Rebecca Minkoff MAM bag. Although I've been doing the Fox in Flats style challenge and posting and playing long each day in order on instagram, I'm still trying to pair similar outfits together to post on the blog. I'm much further behind with blogging than I am with instagram so it's easy to organise the backlog of outfit photos into similar pairings. This was a double style challenge outfit! I tried to play along with #summerStyleFile as well as #DAREcember but couldn't meet every day of them both. The challenges were 'buns hun' and 'to the max' so it was easy to achieve them both with a maxi skirt and a messy bun. You can see my hair a lot better on the Instagram pic I shared. It's definitely getting to that point in summer where I'm tying my hair up more and more! Simple accessories for a comfortable outfit as I worked from home. This is the last wear of this purple tee too. It's nice, but I was looking up the last time I wore it and saw this is only it's third wear, where the other one I have (that's pink and grey) has been worn 5 times. It's obvious I have a favourite and don't need both, so it's left my wardrobe. I have other purple tees I wear more. If only I could apply the same thinking to my many grey tees! Last worn: colourblock tee, striped maxi skirt, Havaianas, Rebecca Minkoff MAM bag. Other ways to wear: colourblock tee without a baby bump, striped maxi skirt and a peach cami, Rebecca Minkoff MAM bag for the office. I really wasn't such a fan of this outfit! I'd previously worn the grey version of this tee to the office a couple of weeks before and loved the outfit. I felt comfortable and happy all day, so wanted to replicate that feeling by wearing the purple tee. The baby bump had grown though and I tugged at this shirt quite a bit through the day, feeling so uncomfortable in it. At least I was just working from home. The maxi skirt I enjoyed wearing of course! It was the first thing I thought of for the style challenge of 'swishy', as my maxi skirts 'swish' around when I walk. If I'd just worn a different tee I would have been much happier in this. I blog my outfit fails as much as the outfits I love though, as otherwise I'd never find an outfit 'good enough' to share. It's also a good way to reinforce to myself what didn't work and how to avoid it in future. After doing this earlier in my pregnancy and wearing something that didn't quite fit right just because I wanted to squeeze in another wear, it's a little silly that I'd do the same thing again. Need to take a few moments more to think through (and try on!) what I've planned to wear as things continuously change as baby grows. Last worn: Ray-Ban Wayfarer, purple tee, black jersey maxi skirt, Havaianas (above), Rebecca Minkoff MAM bag (above). Other ways to wear: purple tee and a lace pencil skirt for the office, maxi skirt and a graphic tee, Rebecca Minkoff MAM bag and a printed wrap dress. Shopbop have an extra 25% off all sale styles for a limited time only! Just use the discount code 'EXTRAEXTRA'. But hurry, it's just for 3 days! You look Chic, as always. Love the glow in your skin, take care. Wishing you a Happy New Year in Advance! Gosh, you are really glowing! You must be so excited, you look great in this outfit, especially the skirt! I want to wish you a very happy new year as well, it's been lovely getting to know you this year! you look so lovely in purple! darling looks! I agree with you. I prefer looking at blogs where I go 'oh I could do that' rather than 'I wish I could' if that makes sense? Real budgets and actually wearing clothes is most inspiring to me :) And hopefully sharing my fails shows not everyone is perfect! I love how you share what you liked (or didn't like) about each outfit. If you're doing a closet clean out you have your blog to go back to for reference instead of just holding on to something because you think you may wear it. I love the purple on you too by the way! Yes it's been eye opening seeing how much I actually wear things! Has definitely helped me with wardrobe clear-outs too. Aww thank you Elif! It's hard sometimes because the bump is always growing and changing and you never know how things will look haha! The purple tees both look adorable on you, but I love that you are honest about your outfits and even if they look adorable in photos why they may not have worked as well throughout the day! I like that you always post your successes along with your outfits you weren't head over heels for - and I love your go-to maxi looks - it's making me miss wearing mine. It can be hard wearing maxi skirts when there's a chance of snow! :( Hopefully it will warm up for you soon. Wishing you a very Happy New Year Mica!! It is interesting to see what works and what doesn't when I look back! Love the purple T-shirt! Nice bag! Oh my dear, this is such news to me! Congrats =) Still a cute top! You look beautiful and glowing! Happy new year!! Love seeing the pics of how you've previously worn things. Great bag! It is nice looking back, even if it's looking back to see how I've under-worn something! So cute! I'm loving that color on you and you always have the best Maxi skirts! 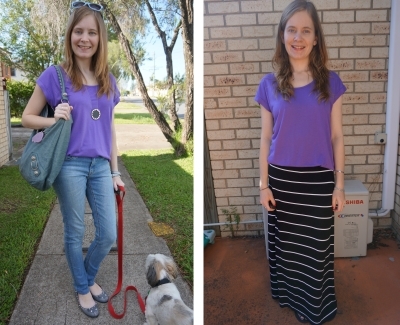 Both of these maxi skirts are just perfect and I really like that purple top but I understand why you feel like you don't need another purple tshirt and you want to get rid of that one...sometimes it is easier to organize our closet. That second look didn't work out in the end? we all have our fail outfits, sometimes it is hard to estimate what is too tight for us. Yep it's very difficult to gauge how things will fit in pregnancy as everything is always changing! It is good to organize and streamline what we own, definitely! You look so lovely in purple, Mica, and I'm loving that striped maxi, too! I think it's great that you share your "fail" outfits because let's face it, we don't always get it right, even celebrities with the best stylists in the business make a fashion fail :) Nonetheless, like I said, I love the color of the top on you; the shade is perfect! I hope you have a very Happy New Year, beautiful! I still like the outfit!! Have a Happy New Year Mica! AW such a cute mama! Happy New Years babe!! I love that purple tee on you! That colour is perfect. Happy new year! Such a pretty mama! Thanks so much for sharing with Fun Fashion Friday & wishing you all the very best in 2016!